Virgil Lynn Holloway was born January, 16, 1952 in Shawnee Oklahoma to Virgil Holloway and Thelma Louise Holloway. He was a blessing to his family and the first and only son. He was raised in Seminole until the age of four. In Seminole they went to the Highway Baptist Church. A favorite family story is, as a little boy, he had a pocket full of marbles that his mother told him to leave at home. Needless to say as the sermon was going on, he lost the marbles and they all began rolling down the floor right towards the pulpit. When he was four the family was transferred for Virgil's work to Sand Springs, OK, and he lived there until the age of eight. Then the family was transferred to Drumright. They lived in the Tidewater Oil Field Camp which was a place built and used previously by Tidewater Oil employees, but Virgil's job was with Sunray DX Oil Company. It was a great place to grow up with many other families and a tightknit community. What they didn't have in material things was always made up for in love. Lynn as he always went by, from all who knew him, attended Lincoln Grade School where he met his lifelong friend, Raymond Hilgendorf. They were always together, whether shooting pool or riding horses. This friendship continued till his passing. His principal there was a man named Mr. Riddle who shaped his life and taught him many life lessons. As a child he loved to play outdoors and loved animals. He would ride his bike anywhere and once rode it from Prattville to Berryhill which is probably almost ten miles. He loved his sisters Carol and Gaye as well as his dog Meme. In Drumright, he attended the First Baptist Church and was very involved and always loved his summer trips to Falls Creek. He attended Drumright High School and graduated in 1970. While in school, he played football and basketball. He also was very involved in FFA and while in AG his teacher, Mr. Formby, made a lifelong impression on him. Lynn was very popular in school and everyone loved him, except maybe a teacher or two. He always told a story of sneaking into the town swimming pool and not getting caught because they were breathing through straws. He also told of seeing Freckles Brown ride Tornado, a feat that had never been done. He made many friends there that would last a lifetime. He always had a knack for talking to anyone and a smile you would never forget. He loved going to his Grandpa and Grandma Hicks’ place in Seminole and always talked of his grandpa's orchard. He also loved to going to Checotah to see his many aunts, uncles, and cousins. He especially loved his grandmother Lola. He always told of when he tried to sneak up on her, due to her being blind; and, she would always say, “Well hello Virgil Lynn.” He was amazed by that. After high school, he went to work for the Santa Fe Railroad and had a lifelong love for trains. His uncle John Holloway was a yardmaster, and before long Lynn and Raymond both worked with him. They lived in Oklahoma City in a house full of people and made many great memories. He was a brakeman and worked the switch yard. During this time, he bought a brand-new Dodge Charger that he loved. He had little fear whether animals, motorcycles, cars, boats, or anything that would go. He had all of these things more than once and wrecked probably half of them. He was always a cat with nine lives. He also loved music and had many musician friends. He saw countless big-name bands at the zoo amp theater with another dear friend, Jim Shelton, and their other friend, Sam Latham, who would get them passes back stage. Later he attended OSU Okmulgee to learn the electric trade. He worked nonunion electric shops for a few years. During this time, he met the love of his life, Cynthia Gentzen Holloway, and they were married in April of 1988. In November of 1988 they had a baby boy named Matthew who was Lynn’s pride and joy. In 1992, he joined The International Brotherhood of Electrical Workers (IBEW) which changed his life forever. He loved the brotherhood and all it stood for. In 1991 the family moved to Fort Gibson, Oklahoma to be close to his sister Carol and her family. Before long the whole family called Fort Gibson home. He traveled all across the country doing electric work and being with his brothers. His road dogs meant a lot to him including Curtis Sparks, Carl Roberts, and Lynn Phelen. In 2006 Cindy passed away and he came home for good to raise his son. He also worked for Cherokee Nation Enterprises during this time and was loved by all he came in contact with. During his last years of work, his son got into the IBEW apprenticeship and they spent many hours together driving to work in Pryor, Tulsa and all over Oklahoma. He retired after some health issues in 2017. He was a simple man and lived for his family and friends. He once said "A simple man will never starve." He lived a wonderful life full of love and he had a long-standing relationship with his Lord and Savior and was never scared of death. So, in closing we can all rest easy knowing he is smiling down on us right now with that big grin from ear to ear. Lynn was preceded in death by his wife Cindy Holloway, his father Virgil Holloway and his mother Louise Holloway. He is survived by his son, Matthew Holloway; sister Carol Winn and her husband David and Gaye Wheeler all of Fort Gibson, OK; nephews, Brian Winn, Tyler, Ross and niece Rylynn, all of Tahlequah, OK; Nephews Grant Gentzen, of St. Louis, MO, and Jeffery Gentzen, Charleston, SC; and, his only living aunt, Rachel "Babe" Roberts of Checotah, OK. Also, many cousins, friends, and union brothers. 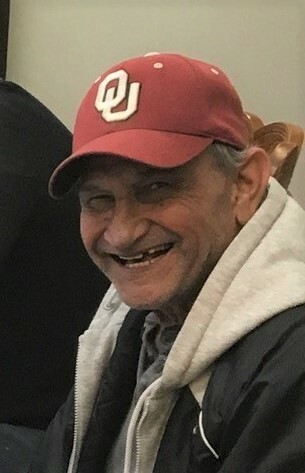 Viewing for Lynn will be noon-7PM Monday, February 4, 2019 at Clifford D Garrett Family Funeral Home in Fort Gibson. A service celebrating Lynn’s life will be 12:00PM Tuesday, February 5, 2019 at the Crescent Valley Baptist Church in Tahlequah with Pastor Bill Parker officiating. Committal prayers and interment will follow at the Citizens Cemetery in Fort Gibson with Eric Olivares, Austin Truitt, Ben Harris, Alvin Andrews, Carl Roberts and Sam Latham serving as casket bearers. Honorary casket bearers are Raymond Hilgendorf, Jim Shelton, Grant Gentzen, Lynn Phelan, Jeffrey Gentzen, Brian Winn, Ross Winn, Tyler Winn, Curtis Sparks, Bruce Roberts, Lloyd Wayne Bivens and Grady Melton Bivens.